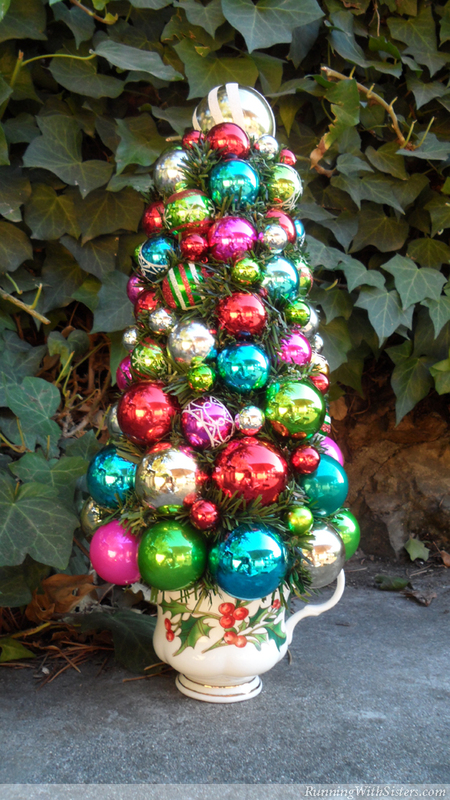 Make a Christmas teacup topiary with shiny ball ornaments! 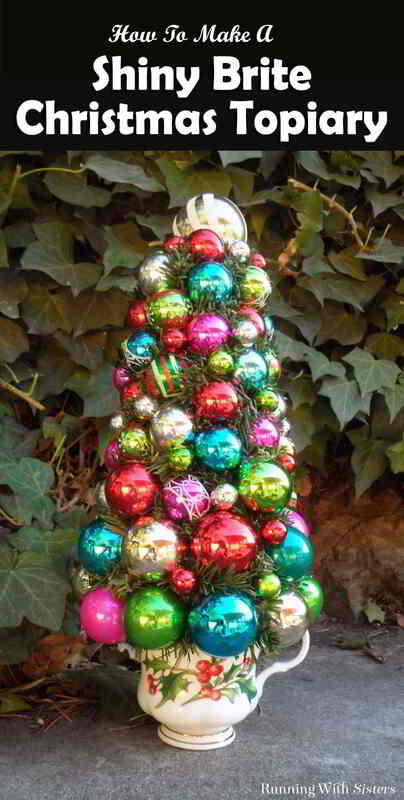 We love vintage Shiny Brite ornaments! We collect them at the flea market and find the at thrift stores too. You can never have too many, we think! If you don’t have real vintage ornaments, you can still make this vintage style teacup topiary with any shiny ornaments. As long as they shine, your Christmas teacup topiary will look terrific! 1. Use the serrated knife to shave 1½” off the bottom of the Styrofoam cone. Shave off enough of the cone to fit snugly inside the teacup. Hot glue the cone inside the teacup. 2. Paint the cone with the Thicket craft paint and let dry. 3. Wrap the cone with evergreen garland, hot-gluing into place as you go. 4. Hot-glue the ornaments to the cone starting with the largest balls at the bottom and shifting to the medium ball ornaments as you move up the cone. Hot-glue the 2” ball ornament to the top of the cone. Fill in the spaces between the ornaments with tiny sprigs of evergreen garland and the smallest ball ornaments. Thank you for the Directions how to make the topiary. So many people only put the pictures on and do not show you how to make the craft.